Prepare pasta according to package directions. While pasta is cooking, sauté beef, onion and green pepper in a large skillet until browned; drain well. Stir in chilies, 1/2 cup sour cream and salt. When pasta is done, drain well. 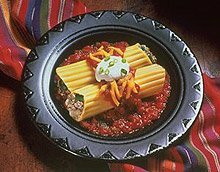 Fill manicotti with beef mixture. Preheat oven to 375° F. Spread 1/2 cup picante sauce over bottom of a glass 9 x 13-inch baking dish that has been coated with cooking spray. Place filled manicotti side by side on top of sauce. Pour remaining sauce evenly over manicotti. Sprinkle with cheese. Cover with aluminum foil and bake for 20 to 25 minutes or until thoroughly heated. Garnish with remaining sour cream and sprinkle green onions on top. Serve immediately.